From the translator: This is excerpt from "The new chapter of fist science" - the teachings of yiquan founder Wang Xiangzhai recorded in 1939 by Qi Zhidu. The essence of a martial art is best explained by the use of the spirit and the energy of body. When limbs are moving, body is stretching and shrinking, blood is flowing freely, health improves and body becomes stronger – this is related to the aspect of the energy of body. And as for the source of body movement, this belongs to the aspect of spirit, mind. 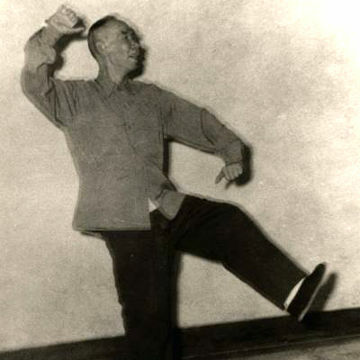 The movement of body is directed by yi – mind. Mind is considering everything. The term mind is a general description of all aspects of mental processes. Where yi is directed, shen is following. This is the basis for the whole body movement and issuing of power, which is naturally expressed outside body. You can see that the source of movement is in mind, mind is unifying the whole movement. Knowledge, observing, reacting, movement and stillness, are a basis for each other. All of this have the source in the mind. To become skillful, you need to understand how opposite forces are born, and what is the meaning of mental guiding. To use mind, energy, force outside of your body, you need some space, you need to take care about balance and unity. Without working in this space, you will not achieve those incredible skills. So in a martial art training you need to use the space outside your body to achieve the full skill. You practice as if swimming in the air, awareness is reaching outside your body, but there is a balance, body is in a natural order. It is said, that practicing a martial art, you need to practice with awareness. When mind is detached from your body, it is not reasonable, but if it concentrates too much on your body, it is even more wrong. When you practice a martial art, the spirit should be in harmony with energy. Cultivating and training must become one. Only then it will be a true martial art. To achieve this, you need to practice counciously. When talking about this, we need to mention a typical problem – being too impatient to achieve the goal. In such a case there appears unnecessary effort in your mind and your body, the flow of blood becomes disturbed and the true strength cannot be expressed. If you are trying with too much effort and in haste, you will not achieve the goal. So the first important thing is giving up using force. The method is practicing counciously. Mind is checking the states of your body – if you feel just a bit too much effort, you should go back to the state before starting the action. When you start a movement, try to feel what's happening, and make changes accordingly. If you practice like this for a longer time, you will move back to natural, in your whole body there will be a feeling of comfort, as if you din't use any force. But then there will be a strenght in your whole body, and it will be expressed outside. So you should not try to use force, as this would be harmful. The practitioners should understand this. The principle is that mind is before movement. The ancients were expressing this in many various ways. You need to know, that force is born with a movement. The basis is the opposite forces, and the main thing is using the energy of movement. From stillness the movement is born, and movement changes again into stillness. The energy is born. When you are using this, this will be movement following mind, the force will be everywhere. This is practicing counciously, without unnecessary effort. This is described as: „when hands react being guided by mind, you will achieve the goal”. If you want to use force to the left, your mind should first be directed to the right, if you want to use force to the right, first take care of the left. If the force should be directed upward, first should be sinking, if downwards, then lifting should preceed it. You should not think only about one direction. The old treatise says: „Use force as a silkworm creating a thread”. Also: „Strength as if using a carrying pole”, „steps as the movement of huai worm”. Take fullness from emptiness, use the energy of movement, let the changes be united. First following, then opposite. This it the explanation of using energy. Following and opposite are based on each other and are used simultanously. When you learn a martial art, you should understand the coming energy and departing energy. Those concepts of coming energy and departing energy have a deep meaning. Practicing conciously is connected to this coming and departing. If you are using force all the time, this is wrong (Mind is before movement, even if movement is stopped, mind is still there. This is an instruction for a beginner. You need to learn this, experience this, use this). You need to master the art to such a level that you can act spontanously. Mind is not coming from outside to inside, but from inside is expressed outside. You must be aware of outside, but you also need to be aware of your body. The practitioners should understand this well. When learning a martial art, you need to learn principles, the use of mind and the form. When mind is observing the space around your body, it should achieve the same level as when observing your own body. If you focus only on learning outside form, not knowing about principles and the way of using awareness, your mind will be under too much burden and your thoughts will be in chaos. Not only will this not be beneficial, but it can be harmful for you body and mind. The fullness of awareness, and not resemblance of form. When awareness if full, there will be unity and efficiency in movement. Without thinking about unity, the unity will appear naturally. When you practice a martial art, you should think frequently: „why such a movement?”, „what is the purpose of this movement?”. If you practice diligently, you will achieve the goal. In the martial art practicing counciously is stressed. Those who achieve this, can reach the highest levels. You need to master the ability of practicing counciously. When you don't learn this, how can you use this? What does it mean to master the ability of practicing counciously? I talked about this before, so I will not repeat it here. You need to seek this in the changes between stillness and movement. If a movement is going to happen, you need to ask: „why such a movement”. You need to ask if the movement is conforming the demands, what is the function of bending and strengthening, position of surfaces, where is the point of applying force? Most important is if this movement is appriopriate in this moment, in this situation? Especially you need to check, if after the movement body is still in the state of comfort, just like in stillness. If you practice like this, you will achieve the ability of practicing counciously. Until you achieve the level when awareness is everywhere, when you feel comfort in your body in stillness and movement. Those who are not practicing counciously will not achieve this. Mind is checking body, body is subordinated. This should be happening naturally, spontanously. Only when practicing counciously is not based on trying with effort, you will be able to achieve the subtle levels. Those who are thinking about practicing counciously, are not able to practice counciously. So if you think about it, it is wrong use of mind. The practioner first gets to know the way or practicing counciously, achieving this ability and then is maintaining it. Finallyt there is maintaining without counciously trying to maintain. Only then we can talk about true understanding of practicing counciously and maintaining awareness in practice. When there is trying, it is fake councious practice. Only when councious practice will achieve the level of uncouncious, the incredible starts appearing. The ancient philosophers used to say: „guard the unity of spirit”. This is describing the state after achieving the ability of practicing counciously. If you don't achieve this stage, there is no talk about natural. Body movement and awareness will neglect each other. You need to achieve the level when nothing is neglected, when there is no harmful trying. When talking about practicing counciously, some people might misunderstand this, thinking that it is about some kind of desire. So you need to know, that the mistake of trying too hard is result of a disire. You need to calm down, achieve the state without desire, so you can avoid trying too hard. „No thoughts, no desires” - this expresses the deep meaning. So you need to get rid of desires, if you want to achieve the level of incredible abilities. When you regulate breathing, mind becomes calm, spirit becomes clear, mind becomes stable. When mind is stable, there is energy in movement, there is feeling as if in being in stillness. Then in the movement you heart is not galloping, you are not thinking about too many matters, spirit is not wandering astray, there is no nonsense movement. When you start from practicing counciously, eventually you will achieve great skill.